You can setup your new Beaconstac account after you receive the beacons that have been shipped to you. In the box, you will find instructions on the inside flap on how to turn your beacons on. Depending on the kind of beacon you ordered these instructions vary: indoor, pocket, keychain, and outdoor. 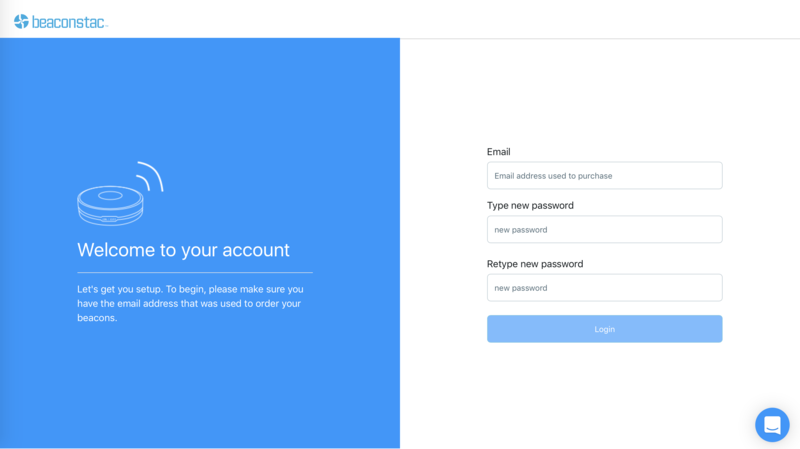 Once you have turned your beacons on, head to the Beaconstac dashboard setup page to set your account up and choose a password. Remember that you must enter the email address used to place your order. In the dashboard, you should see all your beacons under the Beacons section. To verify that your beacons are active and broadcasting, download the Beaconstac app (available for iOS and Android) and login with the email address and password that you set up in the previous step. All active beacons that have been powered up will appear in the "My Beacons" section of the app.